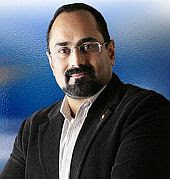 Independent MP Rajeev Chandrashekhar, recently became the only Member of Parliament to decline the proposed salary hike for MPs, protesting the Government of India’s inaction on One Rank, One Pension issue for former members of the Indian defence services. Chandrashekhar, a businessman who first made his billion in telecom, has written to Prime Minister Manmohan Singh stating that there is need to resolve long-pending demand from armed forces veterans. In this interview with Rediff.com’s Vicky Nanjappa, Chandrashekhar explains the reasons for his stand and spells out his next course of action. ***Do you think that rejecting the salary hike has set a precedent for other MPs to follow suit? @ My decision to decline the salary hike till the government re-examines the long-pending One Rank, One Pension issue is a personal one, and consistent with my long-standing belief and position on this issue. I could not get myself to accept a 300 per cent salary hike when armed forces veterans are forced to take to streets demanding equitable treatment for their pension. I would be very happy if public awareness and outrage is ignited as a result of this and our political leadership is then spurred into action. That would be an acceptable and happy outcome to this. … I am aware of one or two very senior bureaucrats who have taken it upon themselves to ‘teach these protesting veterans a lesson’ and have blocked and diluted every effort by the political leadership to give this long overdue honour to the veterans and servicemen. ***How has the prime minister responded to your action? @ Well, the letter has reached the honourable prime minister, though I am yet to get a response. ***Why do you think the prime minister has ignored such an important issue? @ I have met the prime minister/defence minister on a number of occasions to discuss this issue and the honour and recognition associated with it that the veterans seek. Both the PM and the defence minister have communicated their complete support to this principle, but seem to be relying on their senior bureaucrats, who, it seems, have a long-standing animosity and track record of obstructing the uniformed forces and veterans. As for the salary hike for MPs, I believe that MPs must be compensated better; that would allow them to serve the people they represent better, and they would not have to depend on other sources to supplement their income. ***Who is more to blame for the delay on the One Rank, One Pension issue — politicians or bureaucrats? @ There is a long-standing resentment on the part of bureaucrats towards servicemen because of the respect that society gives to the veterans and servicemen. More recently, I am aware of one or two very senior bureaucrats who have taken it upon themselves to ‘teach these protesting veterans a lesson’ and have blocked and diluted every effort by the political leadership to give this long overdue honour to the veterans and servicemen. ***Have you received support from any MP from any party on this issue? @ The Parliamentary Standing Committee on Defence has unambiguously and unanimously endorsed the OROP and recommended the same to the Government of India. There is widespread support for OROP amongst MPs across political parties. ***What is the next course of action in case the government does not go ahead with the One Rank One Pension scheme? @ I hope this does not come to pass. I hope the government realises the dangerous implications of taking this approach to a legitimate request of izzat (honour) by the veterans who have served this nation for many years. I shall continue to raise public and political awareness of these dangers and of the deliberate, obstructive approach by a few bureaucrats. ***In Karnataka you have taken up the cause of the War Memorial in Bengaluru. Any reason for an affinity towards ex-servicemen? @ Firstly, I am the son of a service officer and have lived my childhood and part of my adult life in the company of servicemen and their families — serving and retired. I have grown up admiring and respecting the strong ethos of national service and duty, ‘nation-before-self’ attitude, valour and sacrifices made by the soldiers and their families. Where in countries like the United States and the United Kingdom, citizens and the government give tremendous respect and support to their armed forces, it pains me to see that our country, our government and a large number of our citizens being unaware and unappreciative of the bravery and sacrifices made by armed forces personnel. It is my honour and privilege to be associated with the Karnataka government’s National Military Memorial Park in Bengaluru, the first such memorial in post-Independence India.